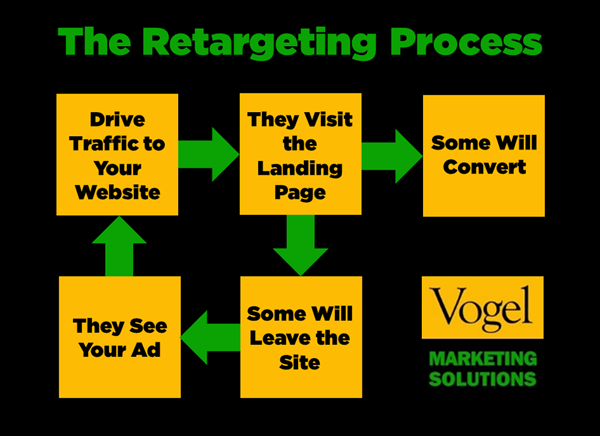 What is retargeting, and how can Vogel Marketing Solutions help? What is retargeting (also known as remarketing)? It’s a form of online advertising that helps place your brand in front of your website visitors AFTER they bounced from your site without converting or taking a specific call-to-action. On average, only 2% of web traffic converts on the first visit. Retargeting allows you to reach the 98% of visitors who don’t convert, and remind them about their earlier interest. I’m sure you’ve all experienced retargeting – you check out the latest Acme Widgets online, but leave their site without buying. Suddenly you’re seeing a small reminder ad for the Acme Widget on Facebook, or on various websites for the next several days. Retargeting uses a simple bit of code to anonymously ‘follow’ your online audience. Here’s how it works: you place a small piece of code (called a pixel) on your website, which is unnoticeable to your site visitors and won’t affect your site’s performance. Every time a new visitor comes to your site, the code places an anonymous browser cookie on their computer or mobile device. When your visitors leave your site and browse the Web, the cookie will serve up your ads ONLY to those previous website visitors. Retargeting focuses your advertising spend on people who are already familiar with your brand and have recently demonstrated interest. That’s why most marketers who use it see a higher ROI than from most other digital channels. Vogel Marketing Solutions can help you implement a retargeting advertising strategy – including A/B split testing, creative development, campaign launching and reporting.